I'm all shawled out. I love knitting them but I think all that 4ply has just worn my poor fingers out. So I decided to put my latest shawl project (which I am designing as well as knitting) on hold for a bit and make some stuff. Quick stuff ! My children have reached the ages now where belting out a kid knit is a bit daunting. The littlest is the only one that's still a nice little size but she is incredibly fussy about what she will and won't wear, I wouldn't even waste my time! But still, I was feeling like I wanted to knit them something. A while ago I requested our local library purchase Katie Boyette's Knit Wit book. You might know her as caffaknitted - designer of some very cool and quirky toy patterns. To my delight the library did buy the book and I had an amusing chat with the librarian about which patterns I might knit. In the end the kids chose one pattern each. M9 picked perhaps the most non-quirky pattern in the book - Owls. I let her pick something from my stash but she wanted something "real" - and the only brown I had was some gorgeous wool/silk that Maylin had dyed for me. It's an 8ply and deliciously smooth (and way too nice to make toys from...let them stash dive, this is what you get I suppose!). I had actually tried to design this yarn into something with little luck so it was quite nice to see it finally made into something. I am quite pleased how it turned out and M has placed him (her?) on her bookcase to guard her books. The wool is gorgeous. I do love silk blends, they are so smooth and the stitch definition is stunning. The colours in this one-of-a-kind skein are just lovely - every colour brown with splashes of teal that really make the colours pop and make it something special. I used such a tiny amount I will still be able to make something else with the remaining ball. 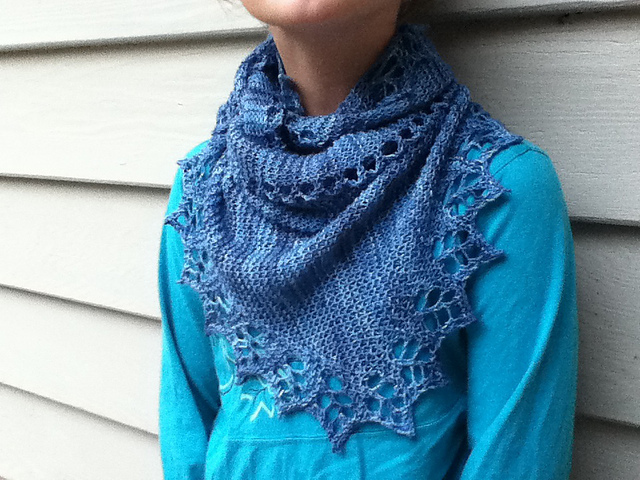 Cute I think, and nice to be able to spend a few short nights and have a FO to show for it. Instant gratification indeed. to stay brave when the news is full of predictions for Christchurch and future quakes. From today's newspaper: "A 23 per cent chance of a magnitude-6.0 to 7.0 quake in the next year, dropping to a 10 per cent risk the following year. More than 90 per cent chance of a magnitude-5.0 to 6.0 shake in the next 12 months, falling to more than a 70 per cent chance in the following year." There are after shocks every day - with every one you wonder if it will be the next big one. The fear never goes away. As much as life has returned to normal, there are constant reminders everywhere of what could happen again. The neighbourhood looks much the same when I blogged 6 weeks after the quake - the buildings might have better fencing to keep people out but the broken glass still lies on the footpath, the church still has a gaping hole in its side. We might venture out more now, but then we see other parts of the city where there is damage. Whole blocks of shops missing, empty lots where buildings once were (and we try and remember what was there before), roads closed or damaged. The cordon has been reduced and now we can catch heartbreaking glimpses of the destruction inside the red zone. The city centre looks like a ghost town. The iconic Christ Church Cathedral in ruins. On the flipside every day it feels like progress is being made to fix things - buildings come down and lots are cleared. Potholes on the roads are fixed. Last weekend much to our extreme joy we were told we could flush our toilet again. For the past 2 months we have been using either portaloos on the street or a chemical toilet that we had to take to a tank down the road to empty every few days. The ability to flush is something I have always taken for granted - no longer. I thank the drainage and plumbing folks who have worked tirelessly to clean the city's sewers every time I go now!! Part of me will always consider Christchurch my home - two of my children were born here, it is where I went to University, had my first job, meet my husband. It's heartbreaking to see it so damaged and to wonder if there is more destruction to come. But we have decided not to stay here. As hard as it will be to leave a city trying to get back on its feet, and to leave my wonderful support network of friends and family, I think it would be harder to stay. I want my children to be normal kids - sleeping in their own rooms, being in a room by themselves, not worrying about where everyone is all the time. I am simply "over it." So...we're moving. DH has a new job,an excellent promotion. We're going back to northland in July - back to the winterless north. I am looking forward to the warmer climate and meeting up with old friends from when we lived there about 4 years ago. We're going rural so it is definitely going to be quite a change but I am looking forward to the change of pace and getting some normal back into our lives. The scenery in Northland is so stunning - rugged and wild and so many beaches. So some exciting (and kinda scarey) times ahead! Wish us luck - a move of 12o0km with 3 kids and 2 cats in tow!!! 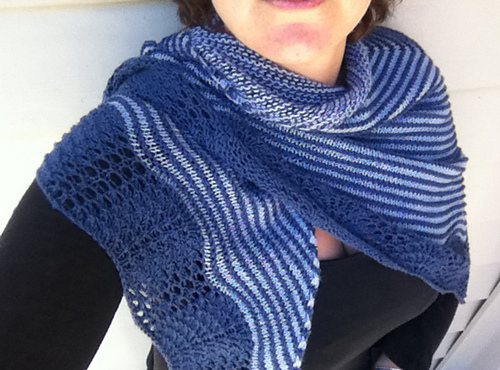 I am on a bit of shawl kick this year. 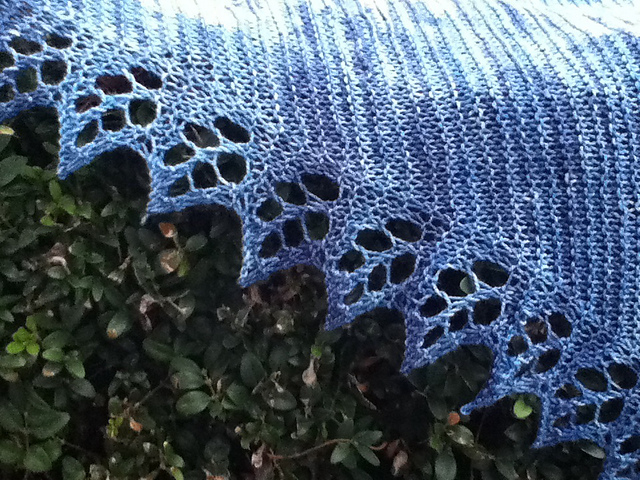 This is shawl #6, (though one has to remain secret still, so #5 that I can blog about). I am attempting 11 in 2011 so I am definitely on track! When I first saw the pattern I thought the top edge was something horribly complicated but was actually just a double yo. I love when something simple to work looks so great. 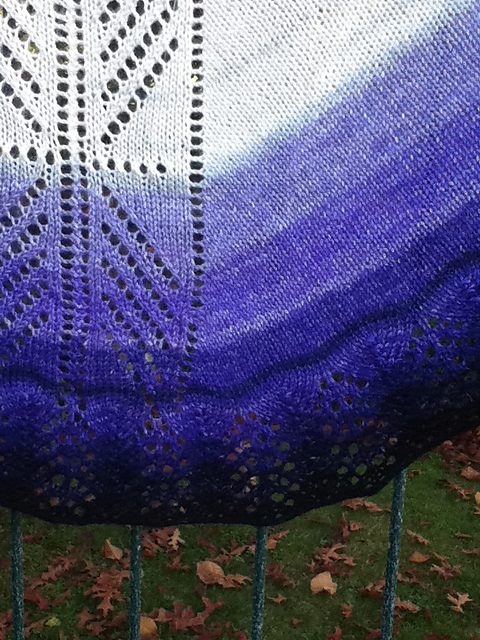 You can see my garter ridges are running up and down, not across - the shawl is knit sideways!! Start with a few stitches, increase till you have used up half your yarn, decrease, then finish on a few stitches. I loved the process - I'm not particularly a fan of those hundredsofstitchestobindoff rows at the end of knit centre-down shawls so this suited me perfectly. The lace was easy to memorise too which is always a bonus and while I wasn't so sure about it when I was knitting it, it blocked beautifully. I'm so happy with how it turned out in the end. The yarn is FibreAlive - Merino Mania from Joy of Yarn. I have used this before - the same colourway Blue Lagoon on my aunt's Multnomah shawl and the berrylicious colourway for the Eiki shawl. 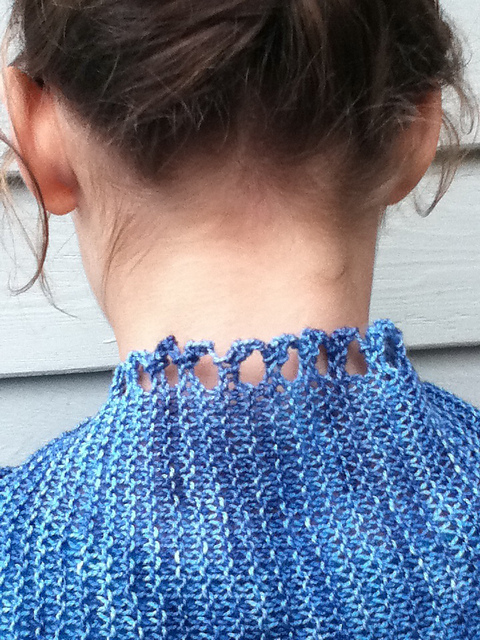 I think the yarn looks so stunning in garter stitch I keep being drawn to using it whenever a shawl has a garter body. Love love love!! 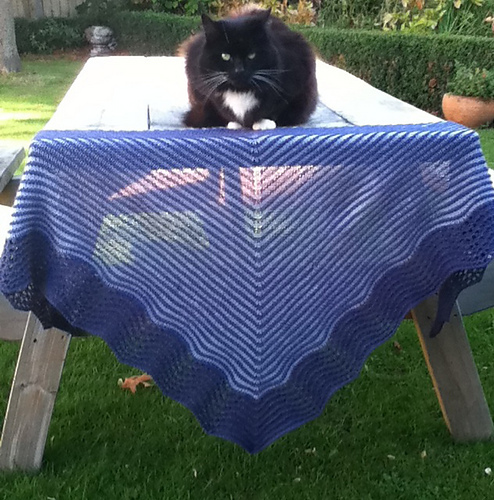 My shawl has a new home in the USA now - with a lovely friend who was my secret swap partner in a shawl swap. I sent a little kete of New Zealand with it - some kiwi chocolate, paua stitch markers and other little bits and pieces that were made locally or were something "new zealand-ish". 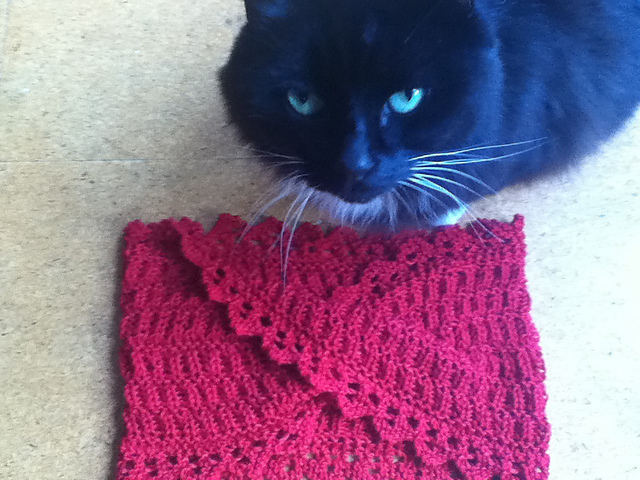 She liked it so I am happy indeed (but now thinking about knitting myself a Pettine!). Pattern number two for the Tri'Coterie Angels Club - Feathers down my back designed by the lovely and superknitter Mnkyknits. This is the first shawl I have made where there is lace happening in the body and I found it not as difficult as what I assumed it would be. The yarn is a deliciously soft and light 50/50 merino silk dyed in the graduated colourway "Elena" - the white through purple to midnight indigo matches the colours of Elena's wings in the Guild Hunter books. 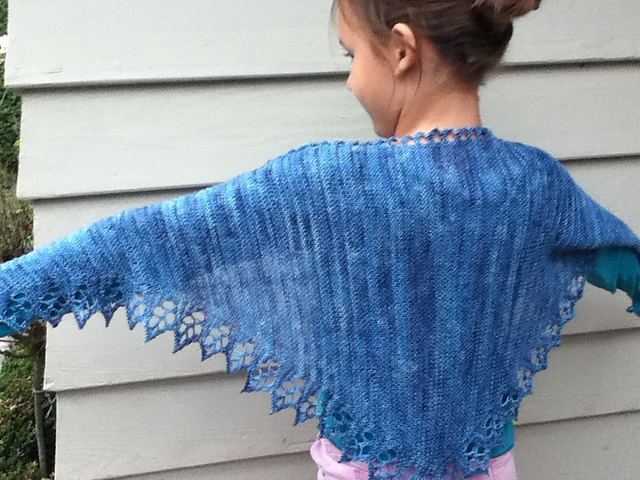 Maylin did a beautiful job of the yarn - so pretty and such fun to knit to see each shade emerge. I knit this while we were on holiday in April and while my children were entertained on the grandparents' farmlet I sat and knit and this was the result. Maylin also knit this in the club yarn but started with the dark at the top which was also a lovely effect - probably better to see the feathery lace at the bottom in the lighter yarn. Being involved with the yarn club has been a lot of fun and it is great seeing the parcels arrive and seeing people's reactions. Our third and final instalment of the Angels Clubs will go out in a few weeks! Been awhile since I updated where I am at with my reading challenge - 52 books in 52 weeks. Current tally: 42!!! As you can see I am basking in the joy of reading - really reading - again. somewhat "homework" reading - really good though. Not literary, knock your socks off intellectual works but a solid, interesting urban fantasy universe with a strong heroine and just the right mix of hot angel sexiness. Singh is a New Zealander and has another series I am quite keen to investigate too. Water for Elephants - I have already exclaimed over how much I enjoyed Gruen's Ape House and this is her more famous novel - apparently her Nanowrimo manuscript (not sure if that is intimidating or inspiring). Water for Elephants follows the story of a young down on his luck man who accidentally finds himself as the veterinarian for a huge train circus during the 1930's. The story has everything from romance, intrigue, and action plus a gorgeous elephant Rosie who steals the show somewhat. Robert Pattinson (of Twilight yes, but also of Remember Me in which he was excellent) plays the lead role against Reese Witherspoon in the movie version which is released here tomorrow. I'm really keen to see the movie and have high hopes for the big top circus scenes but also hoping they don't butcher it too much. This was my audio book for March and it was a really excellent listen - two distinct narrators that allow the flashbacks to feel very real. World War Z was a book recommended by my mum (from her 'best books of all time' that she gave me). I never ever thought that my mum (ex-librarian that she is) would read a zombie book, or that I would enjoy this as much as I did. Enjoy might be the wrong word perhaps - a riveting, engrossing read that I devoured in two days, but also fairly stomach-dropping and harrowing in its portrayal of war and human survival. I don't know why I read books like this, especially given what we have been through here lately, but like the Last Surivor's series I read earlier in the year there is an almost morbid fascination with end of the world type scenarios. This is a book about war, about a global event that changes everything, yes also zombies, but really the heart of it is human endurance and survival. Excellently done and one that will stay with me for a long time. The Sparrow is another one where the potrayal is done very realistically - this one is sci-fi - and will also stay with me for a long time. The SETI programme discovers life elsewhere and a mismatched crew of Jesuits and civilians board a ship that will take them to a distant planet. The story is crafted in parallel - present and past where you know "something" has happened, but it is unveiled slowly , piece by piece our assumptions are discarded until we find out the (awful) truth of what happened. Cleverly done and though about Jesuits, a priest in emotional exile who has a conflict of conscience, I didn't find the theological themes overdone. Lots of thinking about colonisation (and perhaps the arrogance of humans) though. A really intriguing read. Heir to Sevenwaters is written by Juliet Marillier. This is book four in the Sevenwaters trilogy (though I guess with 5 books now it is more aptly described as a series). I own and love the first three books - read years ago the storylines are still vivid and it didn't take me long at all to remember the wonderfully rich druid-ish world of these books despite the years that have past since I read book number three. I think one of the things I love most about Marillier's writing is how well she fleshes out her characters - picking up this book and remembering everything was like meeting an old friend again. Heir to Sevenwaters is another excellent read and I am eager indeed to get my hands on book number five! I've been doing quite a bit of test knitting lately. Some for Tri'Coterie and others just because. I quite like the process of test knitting a new pattern - it gives me a chance to get an idea of do's and don'ts for my own pattern writing (whether it be layout, wording, how to explain things, using charts) and I think my tech editing skills are improving because of it. Hopefully it will help my own pattern writing process - turning ideas into something coherent that others can use. 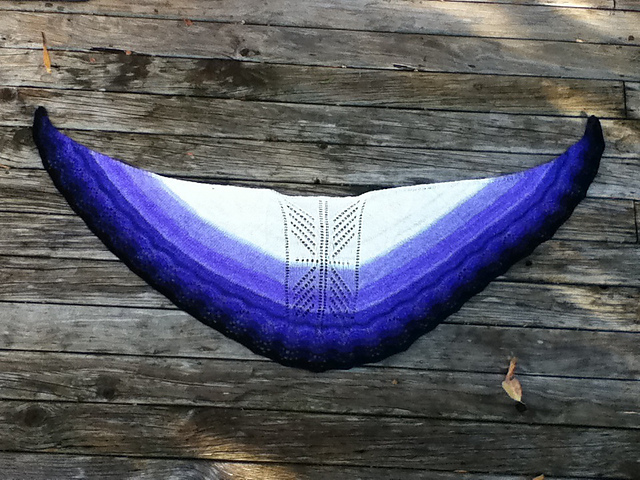 I belong to a test knitting group on Ravelry and recently volunteered to test knit a shawl pattern. It's exactly the kind of thing I enjoy knitting while listening to an audiobook - a plain body that knits itself as you listen and then some lace at the bottom. In this case it was easy feather and fan so I quickly put my name down to test. That's our new diva cat - Mandy. She lived in our house before us and didn't want to move with her owner. When we found her she was a skinny feral ball of knots and now she is very much (the fat) Queen of the house -our pillow stealing, neighbours cat food eating and inquisitive FO photographing cat that acts like we have owned her forever. We love her. The pattern called for sportweight but I had quite a bit of Spotlights Basic Merino that they were selling a few years ago. It's very thin and I have been using it as a sub for sportweight. 4mm needles, two colour stripes. I used about 550m so it is quite big - longer than my arm span and very snuggly because the yarn is pure wool and somewhere between 4 and 8 ply in thickness. I think it might be nice around my shoulders in bed when I am reading or over my knees on a cold night. Winter is definitely making itself known here and it was nice to make something a bit warmer. The pattern is for sale and you can find the pattern link here.